The client's love of rustic western lifestyle and rustic, natural materials are the primary forces that shaped this design. The clients wanted a home that felt that it belonged in Texas. The husband wanted a home like a lodge. The wife wanted a home that was not grandiose or too large in scale. The homesite is located in an equestrian community at Horseshoe Bay, Texas. The lot contains many mature oaks and slopes to the northwest. A creek borders the back yard. The site features shaped the design in a profound way. The home was designed to fit amongst 20 or so trees. Only a few were taken down. A front courtyard was created to capture the southern sun and southeasterly breeze. A dogtrot was introduced to funnel breezes to the back porches overlooking the creek. 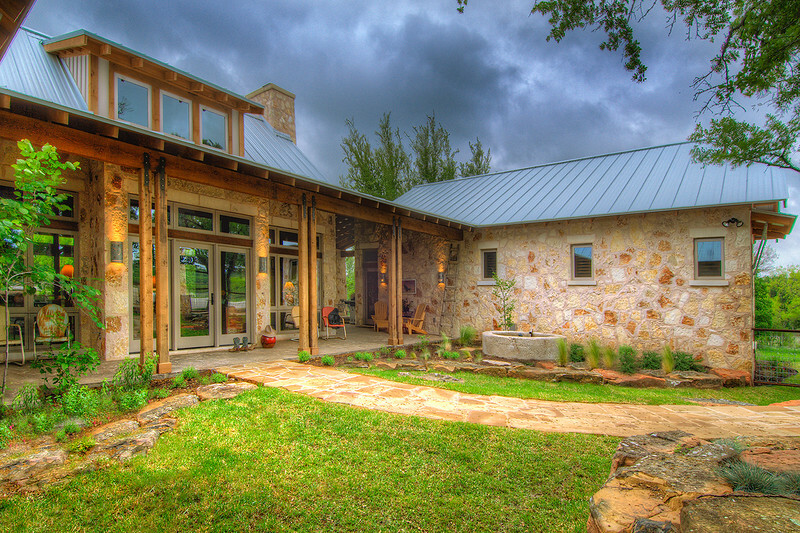 The design is composed of two elements – the main house and the guest house – connected by a breezeway. The main house contains the Great Room, Kitchen, Master Suite as well as a den. The Great Room has windows on three sides, creating the feel of an outdoor pavilion-type space. The Guest House contains two bedrooms, a sleeping porch and Guest Living with a small kitchen. Reclaimed barnwood was used extensively throughout the interior of the home. Limestone was used inside and out. Hardie Plank board and batten was selected for use as exterior siding. A metal roof with galvalume finish was used. Concrete floors were honed and stained. Porches were stamped.